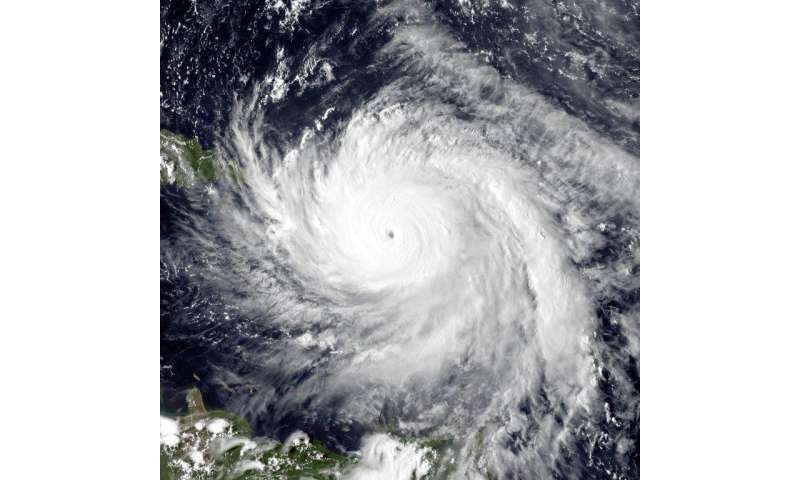 Hurricane Maria near peak intensity, moving north towards Puerto Rico, on September 19, 2017. New research shows Hurricanes Maria and Irma caused a major disruption in the acoustic activity of snapping shrimp and a reduction in insect and bird sounds in southwestern Puerto Rico. Credit: Naval Research Laboratory/NOAA. Audio recordings of Hurricanes Irma and Maria's passage over Puerto Rico document how the calls of coastal critters changed in response to the deadly storms. The hurricanes caused a major disruption in the acoustic activity of snapping shrimp, a reduction in insect and bird sounds, and potentially an intensification of fish choruses, according to new research presented at the Ocean Sciences Meeting Friday. In March 2017, researchers set up acoustic monitoring sites in coastal forests and coral reefs on Puerto Rico's southwest coast to continuously record the area's ambient sounds. Their goal was to capture the region's land and sea soundscapes - especially the cacophony of sounds created by animal vocalizations - and document how and why they change over time. This sonic time-lapse captures audio recorded from August 29 through September 22 on a coral reef shelf edge habitat called Weinberg Reef. It is composed of stitched-together two-second clips from each day at 7:40 p.m., the peak chorusing period for a yet-to-be-identified fish species. Hurricane Irma occurs approximately 5 seconds in, and you can hear the chorus intensify after the hurricane passed. Sound pressure levels in this frequency band (150-450 Hz) were over 5 decibels greater (almost a doubling of sound pressure!) the three days after the hurricane (September 7 through September 9) compared with the three days prior (September 4 through September 6) during this time period. Credit: Ben Gottesman, Center for Global Soundscapes. In nearby dry forests, Maria had longer-lasting effects on the soundscape. There was a marked reduction in insect sounds during the three weeks after the storm. Listen to time-lapse recordings of changes to insect sounds, fish choruses and snapping shrimp activity here. "Sometimes you can't visually assess an impact, but you can certainly capture that through changes in the soundscape," said Felix Martinez, an ecologist and Program Manager at the NOAA National Centers for Coastal Ocean Science in Ann Arbor, Michigan, who will present the new findings Friday at the 2018 Ocean Sciences Meeting, co-sponsored by the Association for the Sciences of Limnology and Oceanography, The Oceanography Society and the American Geophysical Union. "We really need to understand when those changes are natural versus due to some kind of stressor, whether it's human or natural." While the fish increased their activity following Hurricane Irma, shrimp snaps declined steeply during Maria and rebounded in the first few days after the storm. Snapping shrimp make a loud cracking noise with their claws to stun and catch prey. The snapping shrimp recorded in Puerto Rico displayed a very precise¬ schedule of when they snapped the most, almost like clockwork, Gottesman said. After the storms, peaks of snapping activity at dawn and dusk were less pronounced, and it took several days for them to recover to pre-storm levels. This sonic time-lapse captures audio recorded just before, during, and after Hurricane Maria from a coral reef habitat called Media Luna Reef. It is composed of stitched-together half -second clips. Hurricane Maria occurs approximately 4 seconds in, at which point the cacophony of snapping shrimp diminishes until the storm subsides. Credit: Ben Gottesman, Center for Global Soundscapes. Post-storm recordings show the land and sea animals' vocalizations in this part of Puerto Rico, which was not in the eye of the storm, did eventually rebound to pre-storm levels. Maria was a catastrophic disaster, causing an estimated $90 billion worth of damage, but the new findings show how resilient this coastal ecosystem was in response to the storm, according to the researchers.